What’s the one good thing about Femina Miss India pageant? The pageant is not telecast live on TV neither it is stream live in the internet. It keeps the suspense alive as we wait anxiously for the live updates. And what’s the one bad thing about Femina Miss India pageant? We get to see the pageant highlight on Tv after knowing the results. It’s not fun at all. It’s exactly like while watching your favourite movie enthusiastically, your friends are trying to tell you the whole movie story. This year was no exception. I watched Miss India pageant after a month of knowing the result. And much to the fans dismay, Bollywood was there to rule the night. It’s surprising the that the actual contest was more than 5 hours show and when it was telecast on TV it was just for 2 hours. In fact it was less than 2 hours if there weren’t any breaks. 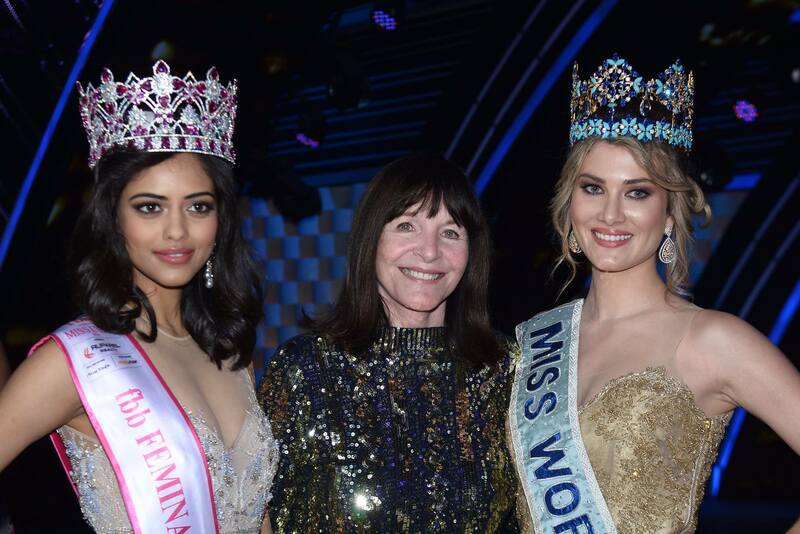 Miss World CEO Julia Morley has attended Miss India finale many times so she must have been used to it by now. But every time she and the reigning Miss World come for Miss India finale it’s something the fans look forward to. While the show goes on all I want to see is Julia and the reigning Miss World. The host of the evening were Manish Paul and Karan Johar. It seems like Manish Paul will continue to be a host for Miss India event for years to come and Karan Johar playing a guest judge and host in between. Is he trying to break the record of Angela Chow at Miss World pageant? 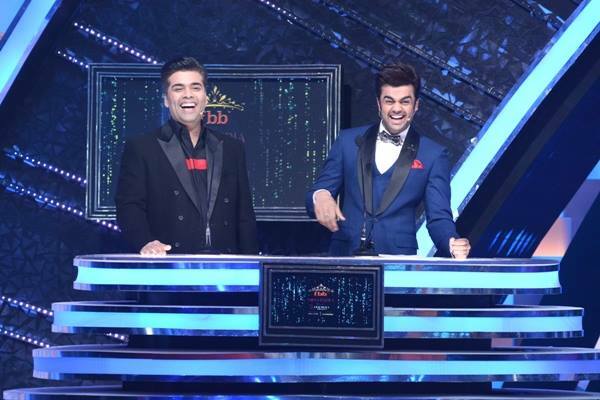 Both Manish Paul and Karan Johar are talented and great hosts with great skills of homour. Their chemistry and humours are amazing but not the kind you want to see in pageants. Less would have been better. The Bollywood Performances: Most of the time I thought I was watching Bollywood Award show. Imagine yourself being among the audience waiting for the result for more than 5 hours and the endless dances and songs sequence instead of entertaining you, bored you. Femina Miss India 2013 contest was an exception. The Fashion Show: Most of the girls look amazing and stunning. This was their only chance for them to shine before some actors could come and take the limelight away from them. Girls whom I find stood out were Priyadarshani Chatterjee, Pankhuri Gidwani, Sanjana GL, Vaishnavi Patwardhan, Rajkanya Baruah, Aradhana Burogohain, Shushruthi Krishna, Adya Niraj. Though this round was short, it was the only moment where we could get to see all the girls before being narrowed down to 10 girls only. The top 10: Dnyanda Shringarpure, Pankhuri Gidwani, Navpreet Kaur, Priyadarshini Chatterjee, Natasha Singh, Roshmitha Harimurthy, Gayathri Reddy, Sushruthi Krishna, Vaishnavi Patwardhan and Aradhana Buragohain were the top 10. The exclusion of Rajkanya Baruah, Adya Niraj and Sanjana GL was surprising. Nevertheless the top 10 was great. If you have the option of being the judge tonight and have the option of choosing any three Femina Miss India 2016, who would you choose? You cannot choose yourself. Priyadarshini Chatterjee: If not me then I would to choose Roshmitha, Shusrithi Krishna and Vaishnavi Patwardhan because I believe that three of them are equally hardworking and I believe that they have the potential and eligibility criteria to win the title. If you have to choose any three different people among the audience and judges to change your life, to be your best friend and life-partner, who would it be and why? Shusruthi Krishna: If I have to choose one person to change my life, it would be Miss Morley because I think she has done tremendous amount of work. She has really inspired and touched the life of a millions of people across the globe. If I have to have a best friend, it would be my mother sitting up thre in the audience because she has been with me in everything I have gone through in life. And if I have to marry someone I think I’ll have to choose Arjun Kapoor. If you were a pet who would you like to be and who would you choose as a master in all of the judges present here today? Vaishnavi Patwardhan0: If I could be a pet, I would definitely be a hamster because they are so so cute and I’ve always wanted one and I think I would choose my master to be Arjun Kapoor because who wouldn’t want to stay with him all the time like he would pet me. If you could be on the cover of a magazine Filmfare, Femina, Time Magazine, India today or Vouge, which one could it be? Aradhana: If I have to choose I would go for Femina first then the others will follow. If you could be Aishwarya Rai or Priyanka Chopra, who are successful Miss India winners and why? Dnyanda Shringarpure: That’s really a tough question. Aishwarya Rai and Priyanka Chopra are me role models and they the one who inspired me to come here. They are the reason why I am standing here . So It’s a difficult choice for me but If I were to choose, I would choose Aishwarya Rai because she is a classic example of Beauty with a Purpose and she has done a lot for the community and she has done a lot for India. That is the reason why I would choose Aishwarya Rai. If you have to go back in time and relive history in mythology, Ram Sita, Krishna Radha, Romeo Juliet and Shah Jahan Mumtaj and why? Gayathri Reddy: I would choose Shah Jahan Mumtaj because they really love each other and I think that love is the most important thing that people need to survive. If you were to have a choice to be Miss India 2016 winner or owner of Miss India org forever, who would you choose and why? Natasha Singh: I would choose Miss India 2016 winner because it has een my childhood dream to become Miss India and I have really worked hard to become Miss India. So I would choose Miss India 2016 winner and later owner of Miss India. If you were given a choice to be a future Prime Minister wife or launch in a blockbuster movie of Karan Johar, what would you choose and why? Assume this all this famous personalities are young, single and unmarried, who would you choose as your life partner and why? Shahrukh Khan, Salman Khan, MS Dhoni, Virat Kohli. Pankhuri Gidwani: Well It’s a very difficult choice. All the people you mentioned are great people and have earned a lot of respect in our own country but I would choose MS Dhoni because he is the one who has brought cricket team to the epitome of what it be and we hae faced a lot of problems where we couldn’t win matches but then he was the one who brought it up, he was the one who brought the youth into the figure and that is why I would choose him. What is that one headline you would like to read in Time’s of India Newspaper two years from now ? Roshmitha: The most successful Indian business women who won Miss India 2016. Unlike previous years, this year the questions asked had too many choices and options to choose which can be very difficult for the girls to answer. There were hardly any direction questions or questions on social issues. Without looking at the content of the answers, Priyadarshini Chatterjee, Pankhuri Gidwani, Shrushuthi Krishna and Navpreet Kaur were the best in terms of delivering their answers with confidence and when they speak their voice and personality charm you. The top 5 based on the top 10 question and answer round were deserving. Roshmitha who never was in my favourite list from the start was growing on me. It wasn’t surprising to see her in the top 5 considering how she shined on the final night. The top 5 again had to face the last question and answer round before the winners could be decided. They had to face a common questions. Roshmitha Harimurthy – “Miss India should have an emotional stability, humbleness and empathy and I have all these 3 qualities. After this round, the three winners were crowned by last year winners and they were Priyadarshini as Miss India World, Sushruthi Krishna was 1st runner and Pankhuri Gidwani was 2nd runners up. One of the best set of winners, the winners of Femina Miss India 2016 are all beautiful and have the potential to do really well at their respective international pageants. Once the training and grooming are over, the transformation of Priyadarshini, Sushruthi and Pankhuri is going to be mind blowing. They already have impressed the fans even before the Miss India finale and confirmed their favouritism by being in the top 3. So, it’s going to be worth the wait.